State Bank of India is an Indian multinational banking and financial service company. It is owned by the government and therefore follows government’s push for education passionately. State Bank of India has many attractive schemes that cater to foreign bound students, domestic students, and students who wish to take skill development classes. SBI offers education loan at an attractive interest rate with student-centrist attitude when it comes to marking tenure of education loan. 1Y MCLR for SBI is 8.55%. The Reset Period for Education Loan is 1 year. The list for premier institutes can be found here. State Bank of India charges no processing fees when the student pursues higher education in India or when the loan amount sought is below ₹ 20.00 Lakh for foreign education. State Bank of India also doesn’t charge any hidden fees on the loan amount sought. The bank realises the potential of students that are able to secure admission in premier institutes and offers them special concessions for the same. The maximum tenure is 15 years on SBI Education Loans. On top of that State Bank of India is one of India’s oldest and most trusted banks so applying for an education loan from the bank is a reliable venture. 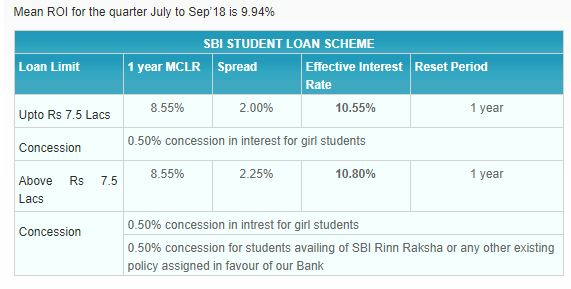 State Bank of India Scholar Loan Scheme was brought out by the bank to provide financial aid to meritorious students who have secured admission in a premier institute of India. The list of premier institutes can be found here.